It’s no secret that the gifts celebrities receive from fans can be pretty weird and ridiculous, but that behavior definitely isn’t just relegated to audiences. Sometimes the entertainers themselves like to offer strange presents to co-stars, and The Walking Dead star Norman Reedus was recently on the receiving end of such a thing from one of the show’s former actors, Scott Wilson, who played Hershel. Scott Wilson? Yeah, he’s my buddy. He actually just sent me his ponytail from the show. It’s in my refrigerator. Okay, so while getting a detached ponytail from someone might be odd for you or me, Reedus doesn’t get fazed by this type of stuff. It’s possible he even asked for it at some point. Regardless of how sensible a gift it was, having Hershel’s ponytail is about as unique a TV prop as you can get. Hershel was one of the show’s best characters, and his death was both surprising and mourn-worthy. Sure, it would be amazing to have Hershel’s severed leg or, even better, his severed head, especially if one were to also keep those in the refrigerator for safe keeping. But there’s no knocking the ponytail, as it was another good use of the show utilizing hair length to clue viewers in on where a character is at emotionally. No Beard Hershel = Naïve and Angry. 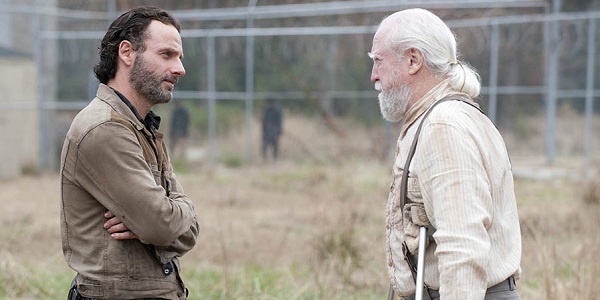 Ponytailed Hershel = Logical and Easygoing. And keeping human hair fresh isn’t exactly new to Reedus either. When asked why he’s keeping the ponytail inside his fridge, he-who-plays-Daryl reminded the world that it’s the same place he keeps the beard that Andrew Lincoln shaved off whenever the show reached the Alexandria safe haven. That has to present some confusion when he has friends over and someone asks him for a beer, and he has to make sure whether they said “beer” or “beard.” Most people probably just want the drink, but there’s always that one guy who’s just a little off, and Reedus’ house is the perfect place for that guy to visit. For what it’s worth, Reedus has also been vocal about other weird gifts he’s gotten from fans, such as breast implants. That’s right, not just one, but two. On different occasions. The price of fame, right? Audiences will presumably get to see Reedus back on The Walking Dead for this weekend’s Season 6 midseason finale. If not then, we might have to wait until the second half of Season 6, which Reedus told Variety is comprised of the best episodes the show has put together yet.